Bourne captain Jack Berry with the Jaidka Cup. Bourne will be hot favourites to beat Stamford Town in tonight’s Stamford Charity Cup Final at Market Deeping CC (July 9, 6pm). The Lincs Premier Division side are tough to beat at T20 cricket with an array of hard-hitting talent at their disposal as they proved when despatching Ramsey in the final of the Jaidka Cup last month. Free-scoring skipper Jack Berry will lead from the top of the Bourne batting order, although the favourites will be without Carl Wilson who is on Minor Counties duty with Lincolnshire against Cambridgeshire at Cleethorpes. 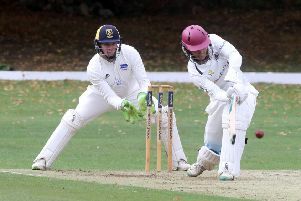 Stamford play their senior Saturday cricket in Cambs Division Two and they are struggling near the foot of the table.